Traveling in Madagascar is different than any other country that I’ve been to. Jim and I love traveling in Africa, and try to get there as often as we can. 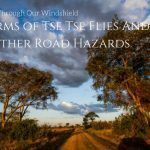 We enjoy safaris and have done so many of them in places like Botswana and Uganda, that we just couldn’t resist trying to do a few in a new country with new wildlife. We expected it to be so African, but it turns out traveling in Madagascar felt much more like traveling in Southeast Asia. Here’s what we learned on our trip to this amazing country. 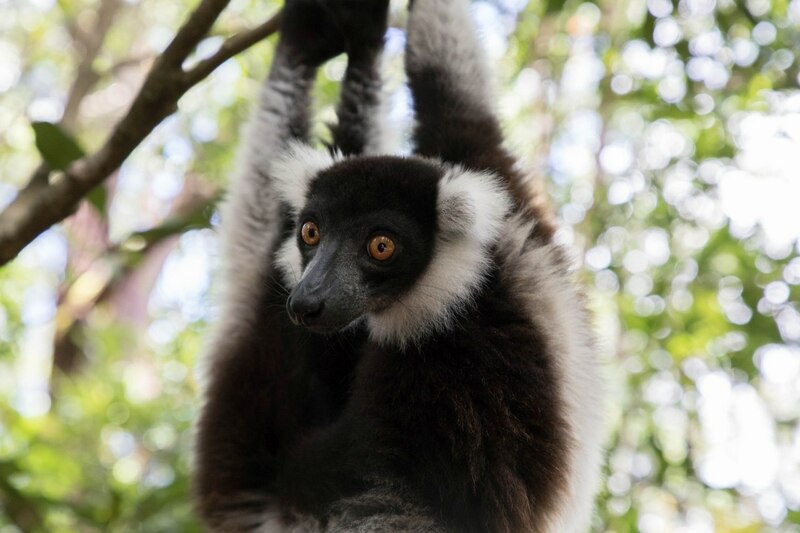 We’ve included some Madagascar itineraries, what do do, travel tips, and lots of travel information. Where is Madagascar Located? And How do You Get There? What is required for traveling to Madagascar? When is the Best Time to Go to Madagascar? What is the Best Way to Get Around Madagascar? Getting to Madagascar isn’t easy, and it certainly isn’t cheap. Since it’s a large island off the eastern coast of Africa, there were no direct flights. Coming from Europe, we had three stopovers and a total flight time of over 24 hours with the majority of the flight time at least during the night, so we could get some sleep. We arrived at the international airport in the afternoon, were taken to our hotel, and the first day was kind of a wash, because there was no energy to do anything except force ourselves to get up and go downstairs to eat dinner. Luckily, by the next morning, we felt refreshed and were ready to get going. For most countries, a tourist visa is required which you can buy upon arrival at the Ivato International Airport for about 20 Euros each. Even though there are no required vaccines, many are recommended such as Yellow Fever, which we had to record the date of ours when we landed. Malaria is still a concern, so it is also recommended to visit your physician and get some preventive Malarials before you go. It certainly is a good idea to check on any new health and safety alerts before you go. Pin these, and start your Madagascar Trip Planning today! The capital city of Madagascar is Antananarivo, which is a serious mouthful, so they shorten it to “Tana,” which is much, much easier. Tana is the economic center and largest city in the country. It is probably the first and last place any visitor will see. We were surprised at the Tana food scene, as they have some excellent restaurants. Check out some more of our Madagascar pictures as we posted each day in Instagram. There are two official languages of Madagascar, Malagasy and French. Before we’d gone, I’d read reports of people not really speaking French, but we did not experience this at all, probably because we stayed pretty much on the tourist trail and were in places that see foreigners all the time. We did pick up a few words of Malagasy while we were there, thanks mainly to our driver who taught us a little each day. English is also widely spoken. We never had problems finding someone who spoke English, and all the guides had amazing English vocabularies. 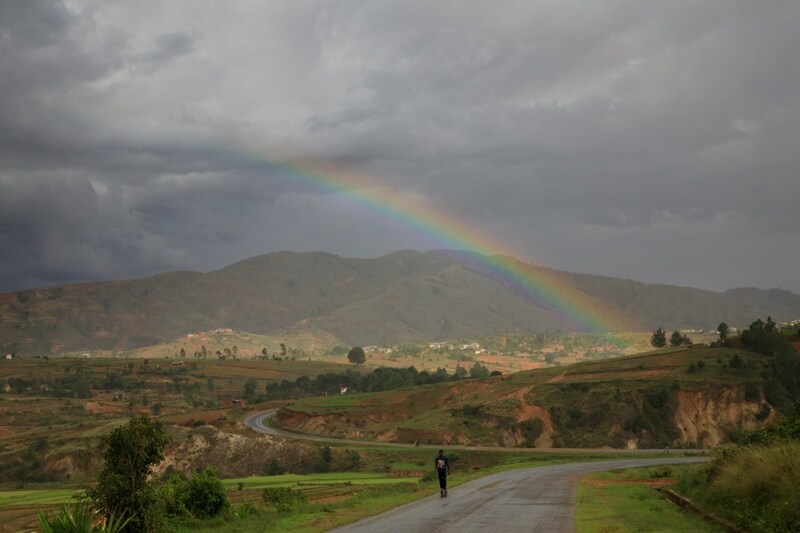 The stunning landscapes of Madagascar, made even more beautiful with the rain. Madagascar’s history has been a bit troubled. First populated by people from Borneo, the Asian influence is still very apparent all over the country. Pirates used to ply the waters around Madagascar, and there are pirate cemeteries and even a Pirate museum in Tana. The French conquered the island in the late 1800s and did not leave until 1960, thus there is also a huge French influence. Today, Madagascar is run by the richest man in the country, and he continues to improve the country’s economy. 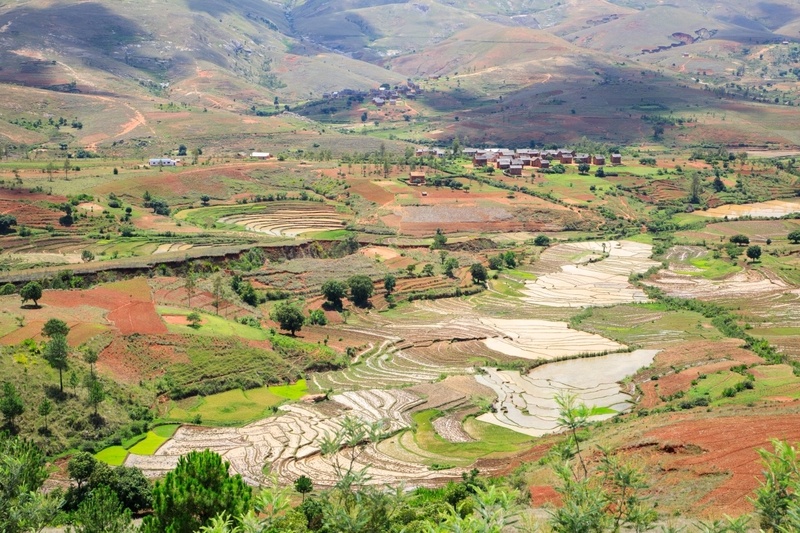 However, Madagascar is still very much a poor country where the average household income is less than $300 per capita, and this is evident as you drive through the countryside. Thankfully, they have a thriving agricultural and tourism industry. 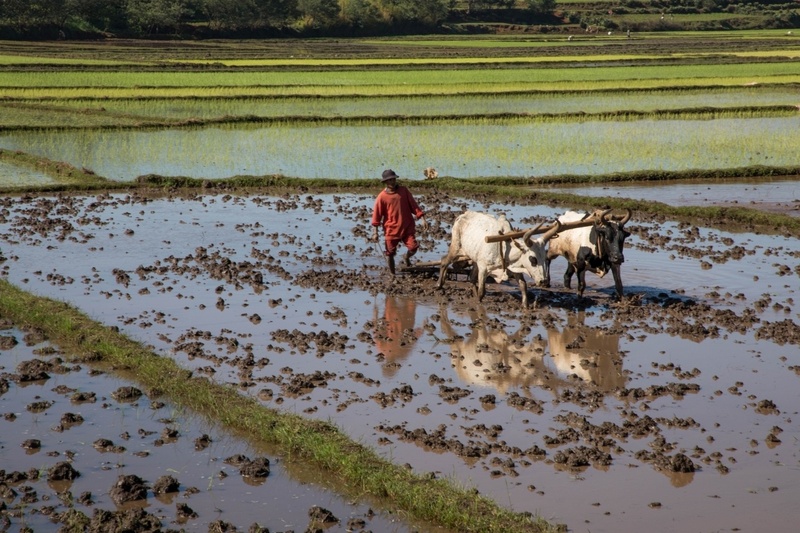 A Malagasy man plowing his rice field with his zebu. Most people visit in June, July, or August, but we went a little off-season. December and January is the beginning of the rainy season in Madagascar, and it’s also summer. We hit temperatures of 41 degrees C, or 105 degrees Fahrenheit, with humidity as high as 95%. Hiking in the rain forests, this can certainly take its toll. We were drenched in sweat, from head to foot within a few minutes. However, the whole country is green. There is tons of produce for sale, and if it rained, it usually only rained in the afternoon for a short while. The downside also was that Tsingy, one of the most famous parks, was closed down for the season; however, we felt it was a great time to go. There were fewer tourists, and we loved the vibrant colors that the rainy season provided. No matter what time of year you visit, Madagascar weather is rather predictable, and you can ask any local and they will accurately tell you what to expect for the day. Madagascar weather is rather predictable, especially in the rainy season. Although it didn’t rain as much as I expected. One thing that was difficult for us to grasp was how large Madagascar really is. When looking at Google Maps, it seemed like a distance of 160 kilometers should take about an hour and a half, but not so. It would take 6 driving hours. The roads are curvy, mountainous, and filled with other cars, trucks, cattle, bikes, and people. We spent a lot more time driving than we thought we would. We had toyed with buying a couple of internal flights to reduce the time in the car, but found trying to make reservations prohibitive with the times and the cost factors. Various modes of Madagascar transport, from human powered to petrol powered. However, there are a couple types of transport in Madagascar. You can rent a car, take a taxi-bus, or even fly, and there are pros and cons to each. The most expensive, but of course fastest option, is to fly into the closest airports to the national parks or to Nosy Be or some of the other islands. The problem with this is that Air Madagascar will cancel flights very easily, and then it’s difficult to plan an itinerary that doesn’t get messed up. We ran into some travelers who’d taken this option and they lost three days from their itinerary because of cancelled flights. 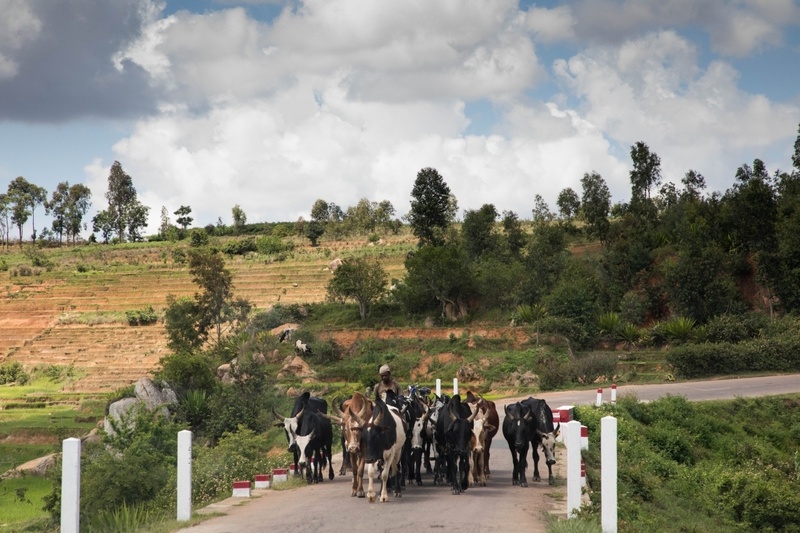 Driving in Madagascar is met with many road obstacles, like this one. The man drives his zebu herd down the road. The second and cheapest option is taking the Taxi-Bus. These are buses ranging from a large van to a full-on bus that travels between cities. You can often find ones that are express taxi-buses so at least you do not have to stop at every tiny village. I met some backpackers who’ve taken the taxi-bus and found it to be quite an experience. The more expensive ones aren’t as crowded, but one traveler told me that she counted the people sitting along with her on the row of seats (3 cushions wide) and there were seven people. Lack of seat belts aside, there is usually no air conditioning and it’s stifling hot as well. The other problem with taxi-buses is that you must pile your luggage on top and many a traveler, local and foreigner alike, have arrived at their destination and discovered their stuff had disappeared. In fact, on the evening we went on a night safari, the drivers were all in a tizzy because a barefoot Malagasy man was walking down the street having been left off by a taxi-bus and he had nothing that he’d brought with him left, including his shoes. He was destitute. Before we went, we had every intention of renting a car and driving ourselves. However, the more we investigated the less likely this became as an option. To begin with, the rental car agencies didn’t want to rent cars to folks who didn’t pay for a driver. So, this is what we did. We hired a 4 X 4 with a driver, and once we were in country and driving, we felt that it was much easier to have someone who knew the ropes be in charge. Manoa, our driver, took care of us in ways that we didn’t even notice at first. He would say things like, “I suggest you roll your window up halfway through the city, and wrap your camera strap around your wrist.” He didn’t want anyone reaching in to take our equipment. He also knew where to buy gas, find a working ATM, eat lunch, handle the few police stops we encountered, and so much more. It definitely took the edge off of making some of the decisions and made our trip very easy. Antananarivo is the capital city of Madagascar. People call it “Tana” for short. We visited for two weeks, and I’ve copied our itinerary which can be easily replicated with no problem. I have also included a one week itinerary, trying to include all the locations I believe to be the best places in Madagascar to visit, even with children. Both can be tweaked to cut off some of the times if you want to fly to parts of it instead of driving each place. If you notice on our Madagascar map, we only visited a small portion of the country. Again, it’s hard to imagine how large this country really is. Two weeks is an almost perfect amount of time to visit Madagascar. You’ll still need to make some choices, and those choices can be pretty tough, but it allows you enough time to really get around a good portion of the country. As we mentioned before, travel times in Madagascar vary wildly. Roads can be difficult or even closed depending on the time of year. Flying can help reduce the amount of time spent traveling, but frequent delays and cancellations can actually increase the travel time between points. The cost of the flights and the variability led to our decision to stay on the ground. We’re glad we did, as Madagascar is a beautiful country and we’re so happy we spent that time on the road. All international flights fly in and out of Tana, so spending a night is almost a requirement. You shouldn’t book a connecting flight for the same day as your arrival or departure given the frequent schedule changes of Air Madagascar flights in country. Instead, book a comfortable hotel with a good restaurant and relax after your long flight. We recommend Hotel Restaurant La Ribaudiere in the city center with comfortable rooms and excellent food. Try the zebu steak! Get out of the city and on the road. You’ll be driving through terraced rice fields, farm land, and mountains on your way to the West. This is a long drive, and there’s not much in Miandrivazo other than some basic amenities. However, it is too far to drive between Tana and Morondava in one day and you should not drive at night (even with a driver). 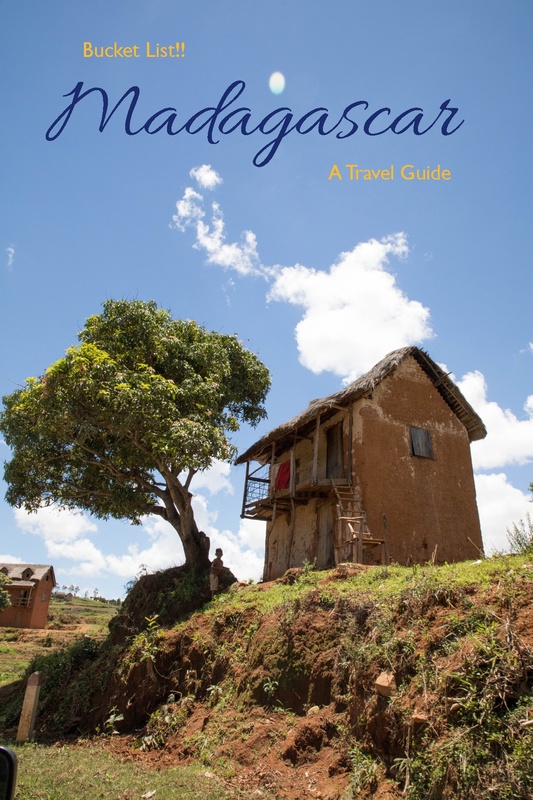 In the summer, accommodation can be hard to find in Miandrivazo, the alternative is to drive from Tana to Antsirabe and spend the night there, instead. Morondava, on the west coast, is a welcome ocean-side town after the hot and dusty interior. This is the base for visits to the Avenue of the Baobabs, hiking in Kirindi NP, and (optionally) treks in the Tsingy NP. 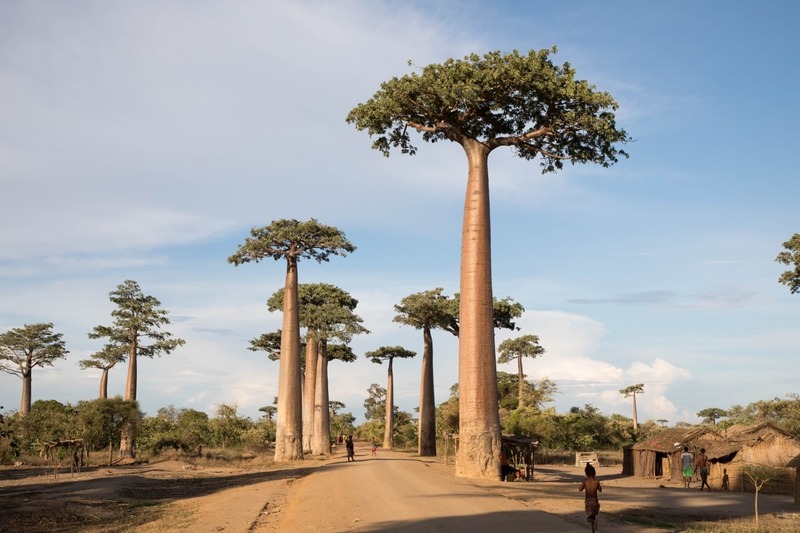 A sunset visit to the Avenue of the Baobabs is a must for any visitor to Madagascar. There are some good hotel choices here, including one excellent spot right on the beach. Perfect for an afternoon swim. Visits to Tsingy de Beharama will add three days to the itinerary, therefore you’ll need to adjust accordingly. Here you should really stay at the beach front Hotel Palissandre with its deluxe beach cottages and, inviting swimming pool, and delicious food. Back on the road, through the mountains, past the villages of the gold diggers, through the incredible rice paddy terraces and on to Antsirabe for a welcome respite in one of the comfortable hotels there. 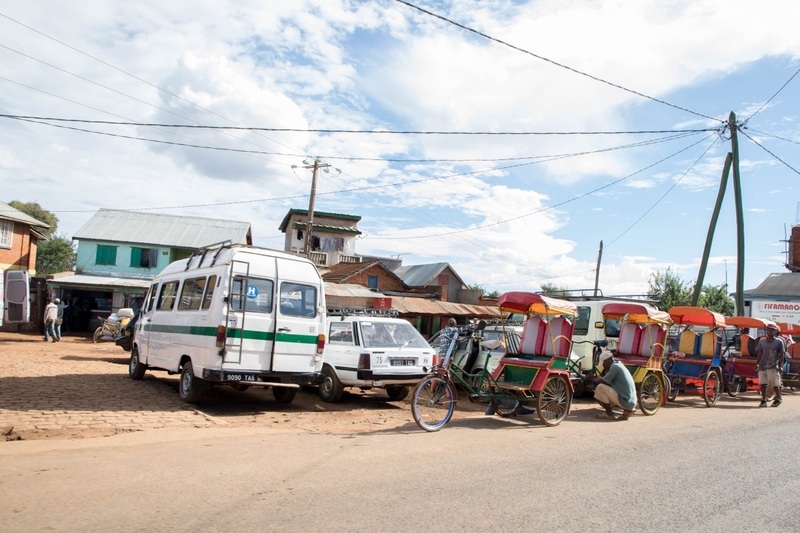 Antsirabe is also home to several cottage craft industries where you can see artisans creating such things as Zebu horn kitchen utensils, model toys made from recycled materials, and visit a gem and mineral shop. Our favorite Antsirabe hotel was the Eco Lodge Les Chambres Du Voyageur with a flourishing tropical garden complete with chameleons! It’s time to head into the rain forests of the east now and visit the famous Ranomafana NP. The hikes here will take you deep into the jungle in search of several species of lemur. Nothing is guaranteed, of course, but if you don’t spot at least four different species I’d be very surprised. This is also the perfect spot for a night safari, where you might spot the elusive mouse lemur. Try to book your stay at Hotel Thermal as early as possible as this popular spa hotel fills up fast. While you there, why not splurge for a massage? Back into the interior and along the central mountain range heading south you should not miss a stop at the Anja community reserve for some more lemur spotting. The stunning scenery changes regularly, it’s hard to get bored along these long drives with picturesque villages, craggy mountain peaks, and vibrant colors of red earth and green fields. Isalo NP offers hiking in deep river gorges and through fantastic sandstone formations. Bring a swimsuit along for a cool dip into the waterfall fed Blue Pool. If swimming in the wild isn’t your thing, stay at the incredibly gorgeous Isalo hotel, Le Relais de la Reine with its magnificent pool. Time to head back north, retracing the route along the world famous National Route 7. You’ll pass through incredible landscapes and colorful villages. Keep the camera handy, this is some of Madagascar’s most stunning scenery accessible by car. After a long day of driving, Antsirabe seems like an oasis waiting to comfort the weary traveller. 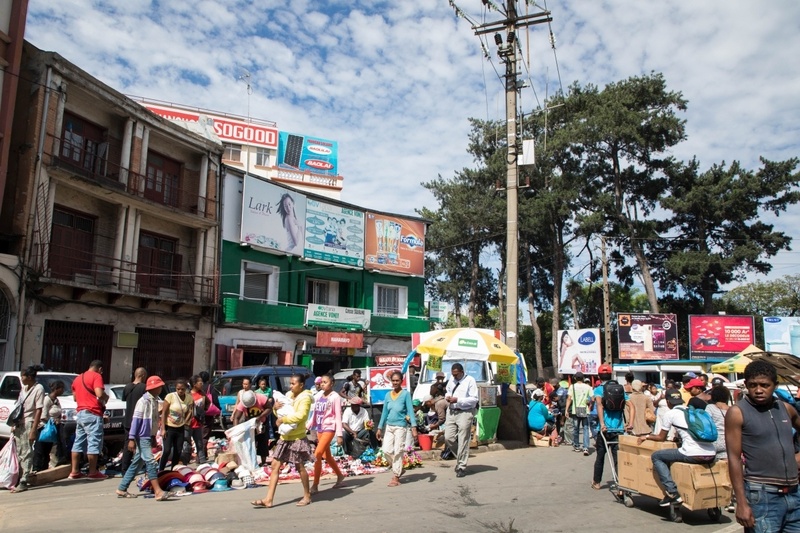 Finish the journey along Madagascar’s beautiful National Route 7 passing through the capital, Antananarivo. Then head east again, through the jagged mountains and down into the rain forests of the East. Andasibe NP has several options for wildlife viewing and hiking in the jungle. You should try and have two days here, there’s that much to see. Finding the perfect stay in Andasibe can be hard, but we really enjoyed our stay at Andasibe Hotel. Return to the capital for one last night before flying out. Don’t miss the sights here like the Queen’s palace, the Pirate Museum, and the UNESCO World Heritage Site at Ambohimanga. If you’re staying in the city, just be aware traffic can be horrendous so plan your transfer to the airport carefully. Finish off the perfect trip staying at the super comfortable Relais des Plateaux and definietly book some time in their amazing spa. Couples massage anyone? One week in Madagascar is not much time, but with this itinerary you will definitely see the highlights like baobabs, lemurs, and chameleons. For a one week itinerary, you will really need to fly in country to make the most of your trip so get online and book your internal air travel with Air Madagascar as early as possible. There’s not a lot of wiggle room in the itinerary, so if your international flight arrives early enough, definitely consider booking your flight out to Morondava on the same day. Book a transfer from Morondava airport to your hotel and be sure and give them your flight number and scheduled arrival time so they can keep track. 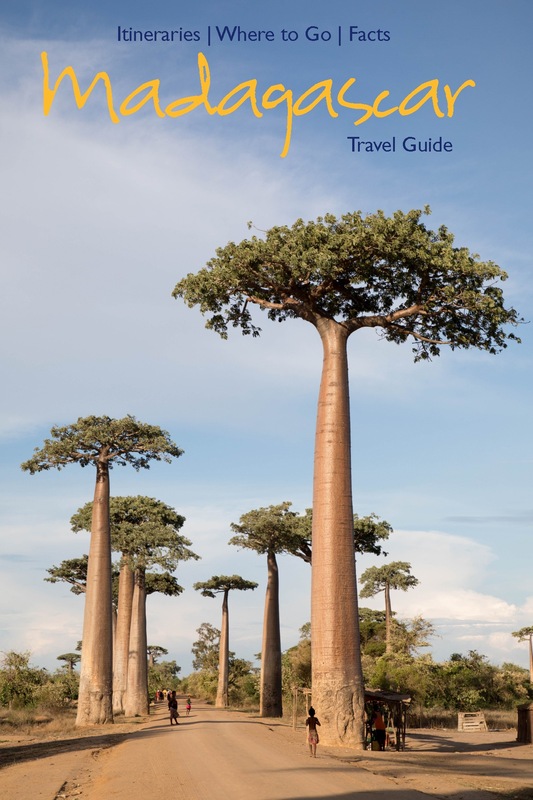 While here in Morondava you can go for a hike in Kirindy NP to see lemurs, experience the awe and beauty of the Avenue of the Baobabs at sunset, go sailing in a traditional sailboat in the Mozambique channel, or take a stroll along the expansive sandy beach. Fly back out to Tana in the afternoon on day three. This is your best chance to see lemurs. In fact, if you go to Lemur island, it’s guaranteed! Make time, however, for a hike in the spectacular rain forests of Andasibe NP where you will experience so much more. Head back to the capital with a stop at Reserve Peyrieras and Ambomahinga along the way. Spend your last night back in the capital and be sure to have your transfer to the airport arranged before hand. Is Madagascar on your bucket list? Pin Madagascar Itineraries for later. Thank you so much for sharing this fantastic article! I would love to go to Madagscar one day 🙂 Your pics are amazing, really really beautiful! I love how you laid out this entire post. I have heard really great things about Madagascar, but this just confirmed all the great things that I have heard about it. Your pictures are stunning, thank you for sharing. I will have to add this to my list of places to go. Your photographs are simply stunning. WOW! We have flirted with the idea of visiting Madagascar for some time, with a deep love of lemurs. It’s interesting to read just how slow the travel around the country is. We tend to over plan trips so, poor transportation is an important consideration. There just seems to be so much diversity around the island, it would be hard to make it all the way there and not go every place. Thanks Jing. 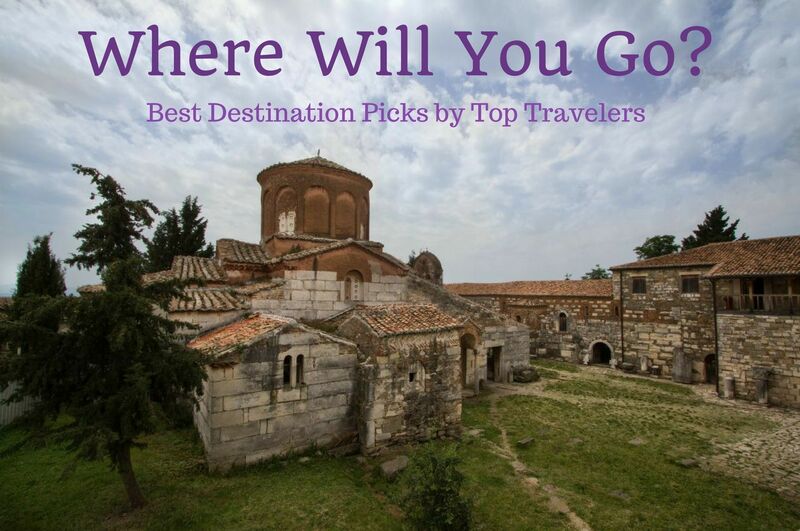 I’m hoping it encourages more people to visit this fascinating country! Damien, Visiting Madagascar during the rainy season was the perfect time for us to go, because we saw so many animals…I loved it. This is a great itinerary! Saving it for when I can afford this dream vacation. Thanks for sharing it with everyone. Katie, I think Madagascar is a dream vacation. We loved every minute of it. Madagascar has always been a dream for us. My sister is planning her honeymoon and was thinking about Madagascar because of the wildlife and beautiful landscape: I’ll send her this article, it’ll definitely be useful! Danila, Wow…I think there would be some stunning places to have a wedding. I wish her luck! Thank you for sharing the itinerary. This makes it easy for us readers to prepare for the trip. I wonder how safe it is for women travelers to use the Taxi-bus option. The picture reminds me of travel in India. Madagascar is one of those places I’ve always wanted to visit, but after reading this article I realize how little I knew about it. The views look stunning, different from what I saw in Tanzania, the only place I’ve been in East Africa. Great shot of the baobab trees too, with the people strolling along, you can see how massive they are. Elijah, The baobabs were the main reason I wanted to go, and I found Madagascar surprising in so many ways. It’s a great destination. Hiring a driver sounds like a good way to get some cultural immersion (and keep you safe). I like your itineraries and your suggestions for stops. It’s lot of valuable information that should help in planning a trip. I love your photo of the Avenue of the Baobabs. Rhonda, The baobabs rank up there with one of the most beautiful landscapes I’ve photographed. I loved them. Madagascar was quite the trip!